Comprehensive review of Pure Synergy PureNatal. See what real experts and actual users have to say about this prenatal vitamin. 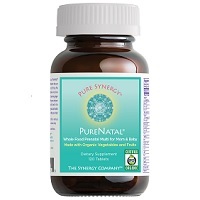 After trying out Pure Synergy PureNatal for a while, I really like this prenatal vitamin. I think it’s very high quality and has a lot of the ingredients pregnant ladies and their babies need during development. The one thing I really don’t like about these tablets is you need to take two pills, two times per day. So I’d often forget to take my second set of pills. I have a hard enough time remembering to take my prenatal once a day, let alone twice! I also had hot flashes a few times after I’d take them. This may be due to the high amount of Niacin in them. As far as other ingredients go, I’m very happy with what they contain. They have 800mcg of Folate, which is great. They’re also loaded with other great stuff for both you and baby. Now, they’re not perfect, they’re missing a few things. But overall, I’m impressed. So I give Pure Synergy PureNatal 4 out of 5 stars; they’re definitely better than your average prenatal vitamin on the market. These aren’t the easiest to use, unfortunately. You need to take four tablets daily, with or without food. The hard part is you need to split it into two doses, so two pills, twice per day. I have a hard enough time remembering to take my prenatals once per day, let alone twice! So this is something I found very inconvenient about these pills. The pills themselves aren’t hard to take. They’re brown in color and about average size. They never got stuck in my throat, and I didn’t have any problem swallowing them. They seem to have a coating on them that helps them go down smooth. Thee pills don’t have much of a taste, mainly because you swallow them. But even for the few short seconds they were in my mouth, I didn’t taste anything bad. They smell a little odd in the bottle, kind of like a Whole Foods store, but the smell isn’t overwhelming. These tablets are pretty impressive as far as ingredients go. This prenatal is made with vegetables and fruit and is certified organic, which I always like to see. One serving contains 800mcg of Folate, which is a great amount. This is an amount I see in a lot of prenatal vitamins and I feel comfortable taking throughout my entire pregnancy. Pure Synergy PureNatal also has great amounts of B6, Biotin, Vitamin C, Vitamin D, Vitamin E, Vitamin K, and Zinc. I’m happy to see good amounts of all these, because these are essential for both you and baby. I was actually very surprised to see that these tablets are high in a lot of vitamins, which you don’t see too often. They’re very high in Vitamin A, which I would discuss with your OBGYN before using. They also have larger than average dosages of B1, B2, Niacin, and B12. Now, this prenatal is a little low in Iodine, Iron, and Choline, but not low enough to be really concerned (unless you have a deficiency in one of these areas). There’s also no Calcium and no Omegas in these, so you’ll need to take a separate Omega supplement (with your OBGYN’s permission of course). But overall, I like the ingredient lineup; it even contains some extra extracts and sprout and berry blends! A few times I’d get really hot after taking my second set of pills for the day. I think it was a mild flushing effect from the high amounts of Niacin. I’m already hot from all the pregnancy hormones, so this is not a welcome side effect! Pure Synergy PureNatal is $35.00 for a 30 day supply. That’s a bit higher than your average prenatal vitamin, but not out of control. Yes! As long as your purchase through their website, you can return the product within 6 months. This is a great guarantee that I’m very happy to see! To buy Pure Synergy PureNatal, click here. Ease of Use Not easy to use… need to take two pills, two times per day. Taste There’s no taste at all. Side Effects I got hot flashes a few times after taking them. Guarantee Yes, they have a great guarantee through their website.